The Grant Building is one of the major distinctive and recognizable features of Downtown Pittsburgh, Pennsylvania, United States. 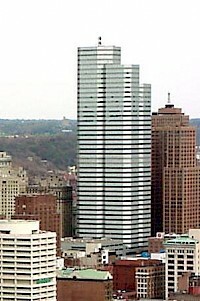 The tower is located on and named for Pittsburgh's Grant Street corridor where most of the city's major corporations and government offices are located. 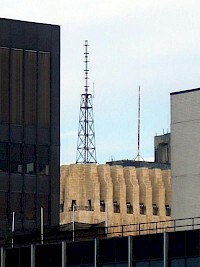 The Grant Building was completed in 1930 and it has thirty-seven floors. It rises 485 feet (148 m) above downtown Pittsburgh. The art deco building's facade is built with Belgian granite, limestone, and brick. 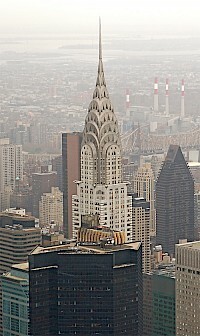 The Chrysler Building is an Art Deco skyscraper in New York City, located on the east side of Manhattan in the Turtle Bay area at the intersection of 42nd Street and Lexington Avenue. Standing at 319 metres (1,047 ft), it was the world's tallest building for 11 months before it was surpassed by the Empire State Building in 1931. 40 Wall Street is a 70-story skyscraper located in New York City. Originally known as the Bank of Manhattan Trust building, and also known as Manhattan Company Building, it was later known by its street address when its founding tenant merged to form the Chase Manhattan Bank and today is known as the The Trump Building. 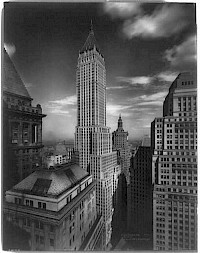 The building, located between Nassau Street and William Street in Manhattan, New York City, was completed in 1930 after only 11 months of construction. The Lincoln Building (now known as One Grand Central Place) is an office building located on 60 East 42nd Street in New York City, opposite Grand Central Terminal. It was completed in 1930. The architect was James Edwin Ruthvin Carpenter. It is 673 feet (205 meters) tall with 53 stories and built in neo-gothic style. The Chanin Building is a brick and terra cotta skyscraper located at 122 East 42nd Street, at the corner of Lexington Avenue, in Manhattan. Built by Irwin S. Chanin in 1929, it is 56 stories high, reaching 197.8 metres (649 ft) excluding the spire and 207.3 metres (680 ft) including it. It was designed by Sloan & Robertson in the Art Deco style,, with the assistance of Chanin's own architect Jacques Delamarre, and it incorporates architectural sculpture by Rene Paul Chambellan. 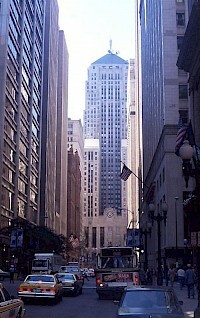 The Chicago Board of Trade Building is a skyscraper located in Chicago, Illinois, United States. It stands at 141 W. Jackson Boulevard at the foot of the LaSalle Street canyon, in the Loop community area in Cook County. Built in 1930 and first designated a Chicago Landmark on May 4, 1977, the building was listed as a National Historic Landmark on June 2, 1978. It was added to the National Register of Historic Places on June 16, 1978. Lefcourt Colonial Building, is an office building located in midtown Manhattan, in New York City, built by Abraham E. Lefcourt. 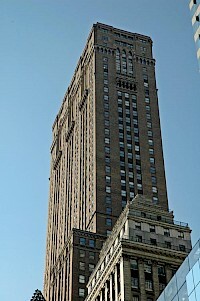 The 538-foot-tall (164 m) Art Deco building, located at 295 Madison Avenue at 41st street, was completed in 1930. It was designed by the Charles F. Moyer Company and Bark & Djorup. When opened in 1930, the Merchandise Mart or the Merch Mart, located in the Near North Side, Chicago, Illinois, was the largest building in the world with 4,000,000 square feet (372,000 m) of floor space. Previously owned by the Marshall Field family, the Mart centralized Chicago's wholesale goods business by consolidating vendors and trade under a single roof.